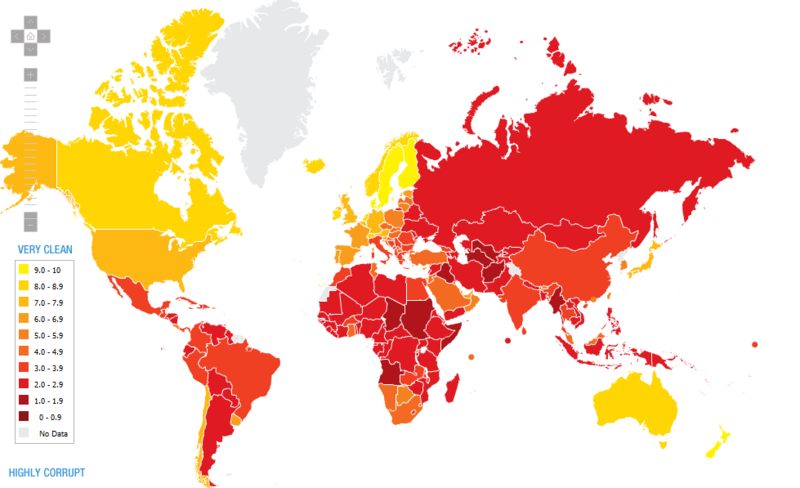 This chart shows Corruption Perceptions Index (CPI) around the world. The CPI index score on a scale from 10 (very clean) to 0 (highly corrupt). 2)Denmark, New Zealand and Singapore tie for first place with scores of 9.3. 3)The CPI shows that nearly three quarters of the countries in the index score below five. These results indicate a serious corruption problem. 4)Unstable governments, often with a legacy of conflict, continue to dominate the bottom rungs of the CPI. 5)Afghanistan and Myanmar share second to last place with a score of 1.4, with Somalia coming in last with a score of 1.1. The Corruption Perceptions Index (CPI) is a “survey of surveys”, based on 13 different expert and business surveys carried out by independent and reputable institutions. It captures information about the administrative and political aspects of corruption. Broadly speaking, the surveys and assessments used to compile the index include questions relating to bribery of public officials, kickbacks in public procurement, embezzlement of public funds, and questions that probe the strength and effectiveness of public sector anti-corruption efforts.